Enterprise Resource Planning (ERP) is a team applied to integrated software systems used to manage the internal and external resources of an organization. These include the physical assets, financial resources, materials and human resource (or staff). 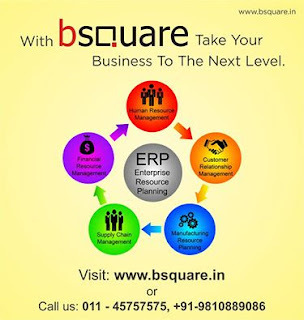 Bsquare solution, ERP software Company, headquartered in New Delhi has developed an intact ERP Software Solution (Enterprise Resource Planning) that helps manufacturers and traders from small businesses to mid-size enterprise sees business transaction more clearly. This development delivers new customized ERP Software Solutions, as also inventory management systems and other development application services.